The Sierra de la Laguna Biosphere Reserve which lies between the Pacific Ocean and Sea of Cortez is commonly referred to as an "island." It is one of the most biodiverse areas on the Baja peninsula, and is home to a large variety of species including the Peregrine falcon, endemic Xantus's hummingbird, Pinyon mouse, Mule deer, and Baja Pygmy owl. The Sierra de Laguna is home to raccoons, lizards, foxes, bats, coyotes and pumas. 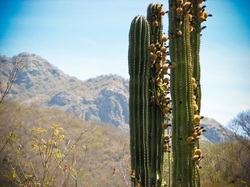 The trail heads to the reserve begin in the Arid Desert full of Cardon cactus, Pitaya, and Torote trees. At 250 meters the Dry Tropical Forest begins with Palo blanco, Palo zorrillo, Buena mujer, and Biznaga. Continuing up the range at 800 meters elevation the Subhumid Pine-Oak Woodlands begin. The Sierra de la Laguna provides water to the communities of Todos Santos, Pescadero, Buena Vista, Los Barrilles, and el Triunfo. Guided day trekks $50 per person includes transportation to trail heads, water, healthy energizing snacks, and a bilingual naturalist guide.